When I was planning out cookies to share this week, my 3-year-old begged for these. He was totally smitten with the colorful candies mixed in – and I totally understand why. These are pretty simple, but they’re so good. I’m sure these will be year-round cookies for us! In a bowl, whisk together the flour, cornstarch, salt, and baking powder. In the bowl of stand mixer, cream together the butter and sugars. Stir in the egg and vanilla. Add the dry ingredients in batches, mixing until just combined. Fold in the M&Ms. Roll the dough into 1″ balls and place on a parchment-lined baking sheet. Bake for 9-11 minutes. Let cook for 5 minutes than transfer to a rack to cool completely. Can’t get enough cookies? 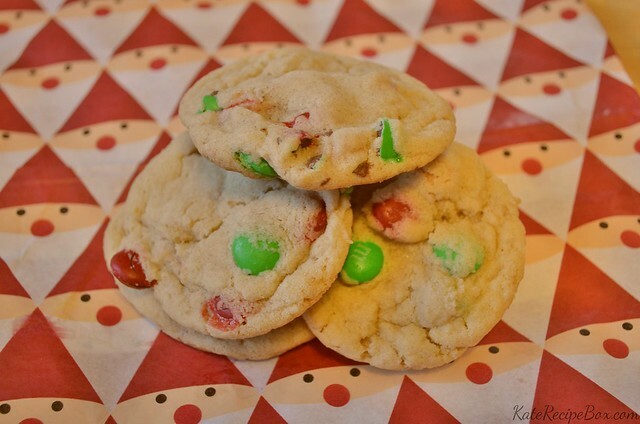 For #ChristmasCookies Week, I’m linking up with lots of other bloggers sharing awesome recipes. You can find today’s batch of goodies below! I can understand why too! Perfect recipe, easy peasy and delicious.